I recently attended a Worden seminar about their new software, StockFinder.com, which will eventually probably replace TC2007, my favorite analytic program. While there, they talked about the free software that they make available to everyone, Freestockcharts.com. Freestockcharts.com is a platform that is very similar to their new StockFinder software, but it is free and provides real time charts and statistics. While many sites provide intraday prices, I learned at the seminar that Freestockcharts.com has an indicator called “volume buzz.” Volume buzz compares each stock’s volume to its average volume at a specific time during the trading day. (I do not know over how many time periods the average is computed.) So, for example, at 10:05 AM I can rank my watchlist by how each stock’s current volume at 10:05 AM compares with its average volume at 10:05 AM. I can therefore see anytime during the day whether a stock is trading an unusually high or low number of shares. Volume buzz therefore enables someone to spot unusual volume in their specific watchlist anytime during the trading day. One just edits the watchlist column to include volume buzz. The picture to the right, taken after Friday’s close, shows that the volume for TYH on Friday was 85.7% above its average total trading volume by the end of the day. Of course, if I had taken a screen shot during the day, the volume buzz statistic would have been computed based on the exact time during the trading day when I would have taken the screen shot. Pretty neat! Freestockcharts.com also enables me to set alerts for each stock, that can be emailed to me immediately when a stock trades in a specific way. (A larger number of alerts and stock scans require a paid for premium service.) Check it out. Meanwhile, the GMI is at 5 and the GMI-R is at 9. The indexes are still near the top of their Bollinger bands and it may not be a great time to start taking on new longs. But as long as the longer term trends are up, chances are that the daily advance will resume suddenly. When stocks surge on good earnings, like AAPL, AMZN and NFLX did last week, we know that we are in a strong up-trend where funds and traders are buying strength. 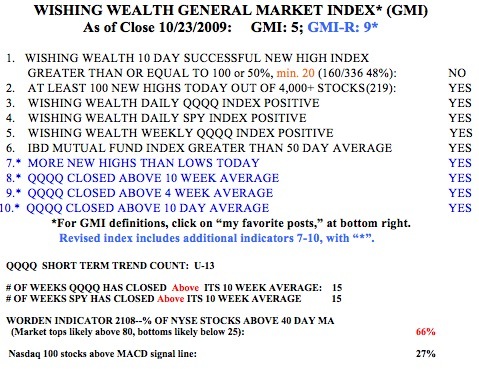 The QQQQ and SPY index ETF’s have closed above their critical 10 week averages for 15 straight weeks. It is unfortunate that so many people have missed this rise. One needs to follow the trend and not try to second guess it. As long as the trend is up, I can go long and manage risk by placing sell stops beneath key support levels. Using Bollinger bands to avoid buying extended from support. Zignals Stock Alerts allow users to receive email or phone text messages when a stock breaks above a given percentage of volume. For example, it is possible to create a volume alert on a list of 50 stocks, so when one of those stocks trades double (200%) the 60-day SMA of volume you will get a text and/or email. This message is sent intraday once the threshold is met. The relative amounnt of volume and length of the look-back period is adjustable by the user. You can also create mechanical Trading Systems which will soon be sold as part of a revenue share with strategy developers. The strategy builder offers volume indicators like money flow and money flow index. All created strategies are free to create and subscribe to during Beta – meaning any trading system created now will be available to earn money once the payment model is implemented without any cost to the strategy developer. Its awesome, i used to pay $100 for that function on tradeideas, now we can have it for free. Ill tell it to my stocksmentor. Im sure he will be suprised having this function for free. Thx for the post ! First time ive heard of this, ive used several scanners that i got from stocksmentor.com but none of them free like this one.